Art begets art, don’t you think? Of course, we may disagree on the definition of art. But I find the more I notice, the more I notice. The more I write, the more I photograph, the more I dream. The more I read, the more I feel, the more I write. When you open up — even just a little — to noticing and noting, you are actually working your art muscle. What I say is not new. It’s not an original thought. Many more experienced at attracting art have said it before I just did. But I notice it happening to me. I see poetry in my photographs, and color in my poems. The art of one lends itself to the other, and suddenly I feel as if I am getting somewhere. It’s not that I am a constant rushing stream of good art. Some of it is just purge. Pages filled with strike outs. I look like this sometimes. But then I laugh at myself. At my #selfie. And I share it with you. And my nervous heart strengthens a bit when you laugh along with me… in the knowing fully that you understand I’m half joking. There’s something that gets in my way, though. Thinking. Too much thinking. About getting somewhere with my art. It’s like that moment when I realize I am lucid dreaming and I know if I think too hard about it, I will wake up. So I try not to think — just breathe, I say — but this in itself is thinking. Back to staring at blurry peacock feathers. What’s the real magic trick? Minding your thinking, I suppose. Noticing it, yes, but allowing thoughts to float away as easily as the 3D Magic Eye design. Blur it away on purpose. Master this, and become a Master. I really, really don’t want a book deal. Which blogger doesn’t want a book deal? Stop pretending like you blog for the fun of it. I say that all the time, too. …In my inside voice. The louder of the two. Stop waiting around for someone to discover you. Stop wanting what other people have. Stop being regretful about what you think you should have done, but didn’t. What blog you should have kept up, but didn’t. What career you should have stuck with, but didn’t. What path you should have taken, but didn’t. She’s only being a little bit judgy, just enough to quiet the screaming. I have a colleague whose dad is a celebrity. She hardly ever talks about said celebrity, except in the context of his dad-ness. I’ve never asked her about this. Or what it’s like to be the daughter of someone so famous. I imagine, though, her modesty has something to do with her relationship to him. To her, he’s dad. It doesn’t matter how famous he is or becomes, his celebrity will always be secondary to her. And I think in all the glorifying we do of celebrity — of book deals, of magazine covers, of awards and prizes and titles — we lose sight of celebrity’s secondary-ness, its subservience. We lose sight of the inevitable real life behind the celebrity. Why? Because save for the tabloid spreads, we hardly see the real life behind the celebrity. The anxiety that comes the day after a book deal was signed. The need to please, to produce, to win. To look good. To smell good. To smile. To have a good hair day. We hardly ever hear of their breast cancer scares, their hemorrhoids, their financial troubles, their soured friendships. Save for the celebrities who’ve publicly shared bits and pieces of their angst in well-placed magazine features, we hardly hear of their suffering. And they all, certainly, suffer. 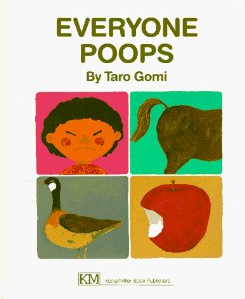 No matter how many times we read Everyone Poops, we still imagine that celebrities poop with greater ease, with more satisfaction, with softer toilet paper. But, most likely they don’t. And, as corny as it sounds, no matter how much we wish we were more famous, more successful, more educated, more experienced, we often fail to acknowledge or recognize how famous, successful, educated, and experienced we already are. This is what I try to tell my screaming inside voice. And I bet I could find someone out there who is not a blood relative that wishes they could have a job like mine, or a husband like mine, or write a blog like I do. Despite that: I still scream inside every now and again when somebody gets a book deal. And I probably will until the day I finally accept that I am already famous enough. The day I finally accept I am already famous, is the day I will finally achieve the pinnacle of my success. Behind all our secret or public clamoring for celebrity, what we really desire is peace, love and ease. And that, my screaming inside voice, is better than a book deal. That man has a gift for producing nuggets of wisdom. Little snippets, little treasures of thoughtful brilliance that may equally apply to your personal life as they would to your career. The more unreservedly I give, the more abundantly I receive. Thank you, Seth Godin. Message received. Seed planted. Abundance tree growing. Soon after reading Seth’s nugget, I wrote … a bit reservedly… a rather vulnerable post. It was one of those that make me hesitate to hit the publish button. In my hesitation, I heard the online voice of James Altucher who writes all the time that his most well-read blog posts –the ones that most touch a nerve — are the ones he almost didn’t publish. So, feeling vulnerable, I hit publish anyway. I published the vulnerable post because somewhere deep down beneath the fear and apprehension was a belief that some good would come from hitting the publish button; some good would come from sharing of myself; someone’s head somewhere would nod along with me; someone’s heart somewhere would swell with compassion or fellowship. Hitting the publish button was me planting the seed. A half hour later I saw a comment come in from Miss Corinne at A Green (ish) Life responding to my vulnerable post (positively) and telling me, by the way, she nominated me for a Liebster Award. I’m not sure what I was more excited about — that she liked my vulnerable post or that she nominated me for an award I never heard of before. Either way, I felt all warm and fuzzy inside. The very essence of the Liebster Award, it turns out, is unreserved giving. The trophy? Paying it forward. Thank you, Seth Godin. Thank you, Miss Corinne. Thank you, James Altucher. Stay tuned for my Liebster acceptance speech and nominations … and watch my abundance tree grow.